Even though there’s snow in the forecast and you may be thinking more about snow removal than landscaping, now is the perfect time to begin planning your spring and summer projects. At Advanced Landscaping and Sprinklers, we love seeing a yard transform from a standard green lawn to a bevy of colors and textures. The New Year will soon be upon us, and if want to revamp your lawn in 2015, call today for our landscaping service in Ft. Collins. Perhaps you love to grow vegetables and flowers, but haven’t found an adequate space to do so with your current landscaping. The team at Advanced can install new flower beds, raised garden boxes, and irrigation solutions that will make growing easy. If you envision part of your back yard becoming a rock garden, we’ll install a serene setting where you can go to relax following a long day. We receive numerous days of sunshine along the Front Range, and enjoying the outdoors in Colorado doesn’t mean you have to trek into the mountains every weekend; you should be able to enjoy nature in your very own yard. 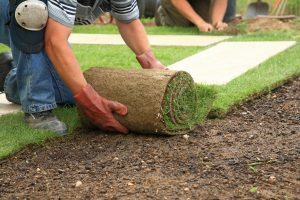 With experience in installing rock walls, paths, new sod, and much more, we can provide your landscaping service in Ft. Collins. You’ll see your yard transform from a ho-hum swath of green to a world of color and texture, where things can flourish and grow. We know that your lawn isn’t always on your mind around the New Year, but it’s never a bad time to begin planning your new landscaping.